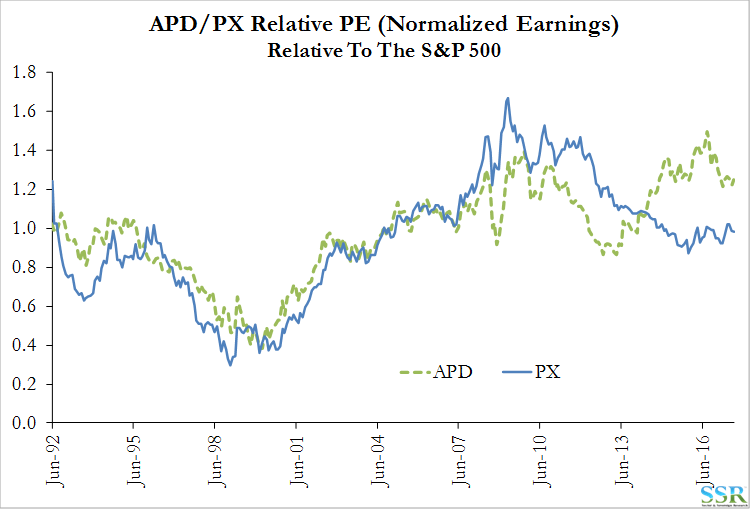 As a follow-up to our piece this week on LIN/PX, we look at the likely consequences for APD – given the possibility of a more challenging market to deploy capital and the stock’s current very high valuation. The stock has meaningful downside risk as earnings growth is unlikely to meet expectations contained in the current multiple (already higher than consensus estimates justify). 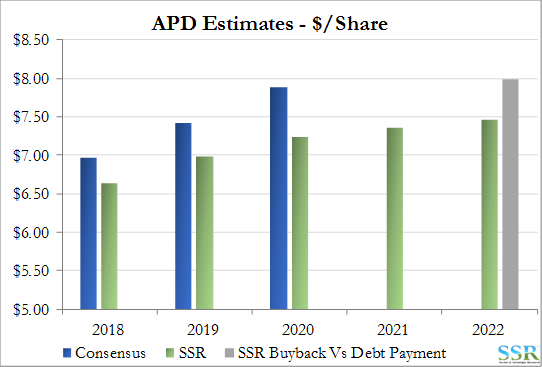 APD will find it increasingly difficult to deploy future free cash and its current high cash balance in anything better than share buy-back, which has a low return at current prices. APD has the highest forward PEG ratio in the Chemical group – aside from a couple of commodity names with zero or limited projected earnings growth. The company also sits towards the top of the list when looking at other highly valued Industrial stocks. It is the most loved industrial gas stock by the sell side in aggregate, which looks at odds with: the current PEG ratio, forward estimates and the limited upside to target price. This is no-longer a “hedge-fund hotel” stock – the hedge funds are long gone. Spending of $1 billion in fiscal 2017 could fall by 2/3 by 2020 within the traditional industrial gas space, based on our analysis. 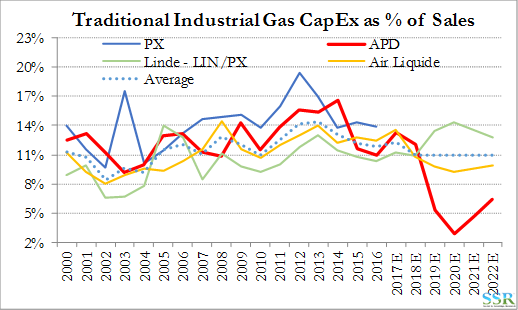 We also expect to see a drop in capex for Air Liquide, though not as significant as for APD, given opportunities for Air Liquide in the US – which will additionally likely hurt APD. 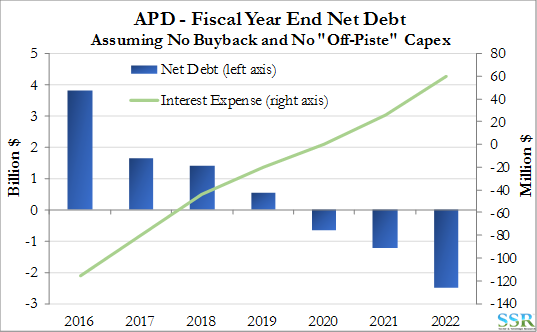 APD is sitting on $3.3 billion of cash and we estimate could have cash surpluses (above capex*/dividend) growing from $400-500M per year in 2018/19 to $800M to $1Bn by 2020. Reluctance to buy back stock is likely a mistake – we think it highly unlikely that the company can build or buy something more accretive to returns instead (*traditional industrial gas). The current multiple for APD is hard to justify with existing forward projections – our capex projections suggest even lower future growth estimates – adding further risk to the multiple. A 20x multiple of our 2020 estimate generates a price of $144 per share – this is a very rich multiple for a company we expect to average 5% EPS growth from 2018 to 2020. A more reasonable multiple for the growth (15x) would give the stock 20% downside. Our analysis suggests that APD will likely be the bigger loser from the LIN/PX merger as the company could be disproportionally impacted as LIN/PX gains share in traditional new business. LIN/PX will be the lowest cost provider for almost any project anywhere in the world and as we have shown in prior research will have the cash flows to take ALL of the anticipated new capital needs for the traditional part of the industry should the company choose to take that route – we define the traditional industry as air separation units. packaged gas and HYCO/Syngas production. 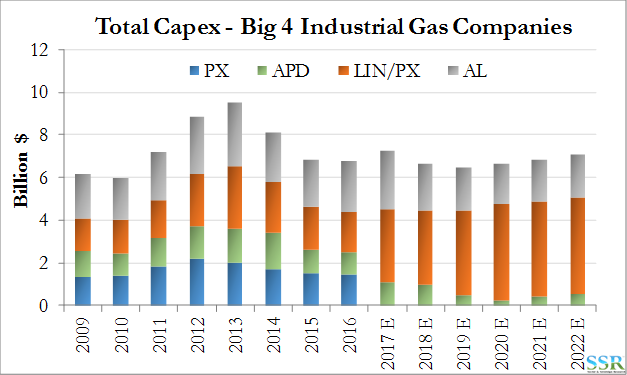 As we also expect Air Liquide to continue its US based investment and because of its size, we see APD getting squeezed out – almost back to just maintenance capex in 2020 – see Exhibit 2. Undercut LIN/PX and AL for new business, accepting lower returns and EBITDA margins as a consequence. Downstream projects – ammonia, methanol, gasification. The company has hinted at gasification investments in China – we are assuming that these are coal-to-gas-to chemicals investments and not waste to energy given the experience in the UK. These are all more cyclical businesses – not “take or pay” industrial gas businesses and growth in these segments would likely hurt returns, increase earnings volatility and uncertainty and possibly impact valuation multiples. Increase the engineering footprint with respect to LNG exchangers and other parts of the LNG value chain. APD is very good in this business, but history shows the cyclical nature of LNG and while the medium-term future looks quite bright, APD has had some bad years in the past. Acquisitions: possible but we think difficult and possibly dilutive unless the company can use its high equity value – at least in part payment. The Yingde saga shows that deals are not straightforward and sometimes just not possible. APD can try to consolidate its joint ventures, but it is likely a seller’s market, and while probably a good strategy we do not think that such a move would make an impact on already high valuation. Buy back stock – so far, the company seems reluctant and is more focused on other capital opportunities, such as gasification investments and possible acquisitions. There could be as much as $6 billion of free cash between now and 2022 available for stock repurchase even with slower growth. This is partly due to the high levels of cash on hand today and partly due to the lower capex opportunities discussed above. In our model, we have assumed that free cash goes to pay down debt and accumulates on the balance sheet and we have adjusted interest expense/gain accordingly as shown in Exhibit 3. The swing in interest payments/gains from 2017 to 2020 is around 8.5% in terms of EPS. If we hold net-debt constant and instead buy back shares ($6.0 billion at $200 per share over 5 years) it would be 7% more accretive to EPS than simply building cash. Our EPS estimates based on the expected lower capex and the value of the increasing cash balance are shown in Exhibit 4. To date, Seifi Ghasemi has done a fantastic job at APD, cutting costs, refocusing investment and divesting non-core assets. However, as options become more limited going forward, we think the stock looks very expensive. 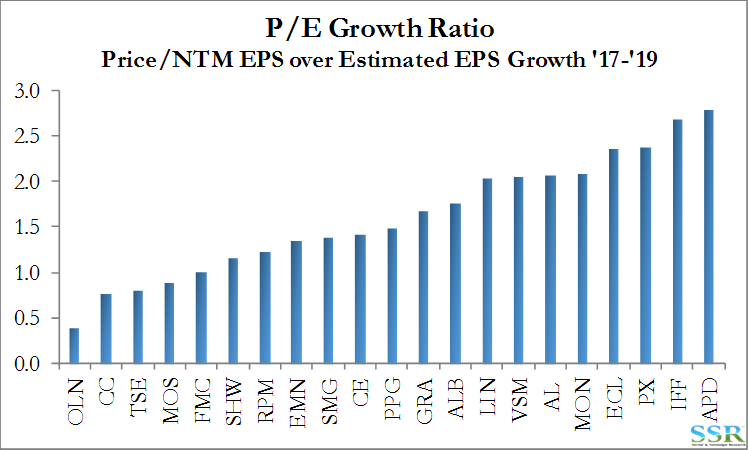 This is function of both the multiple and the relatively low forward EPS estimates. Aside from WLK, no chemical company in the US has a higher forward PEG ratio than APD – Exhibit 5. WLK and LYB are missing from the chart – WLK because its PEG ratio on forward earnings is 5.3 and LYB because forward earnings growth is negative. 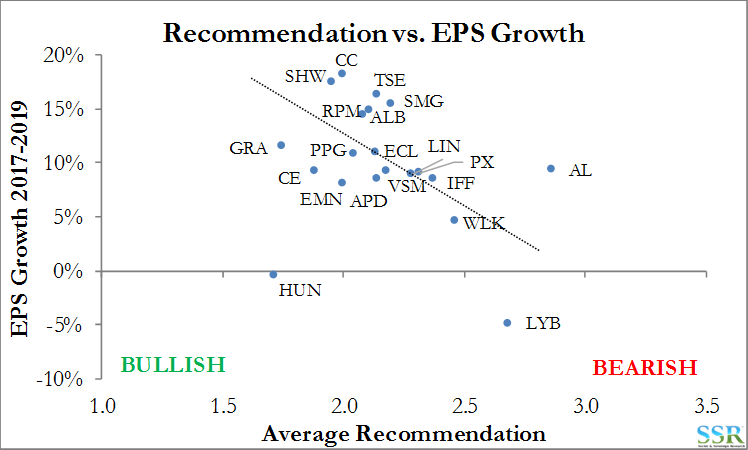 If we look at EPS expectations versus recommendation, APD sits in the middle of the pack, but the wrong side of the line – Exhibit 6. 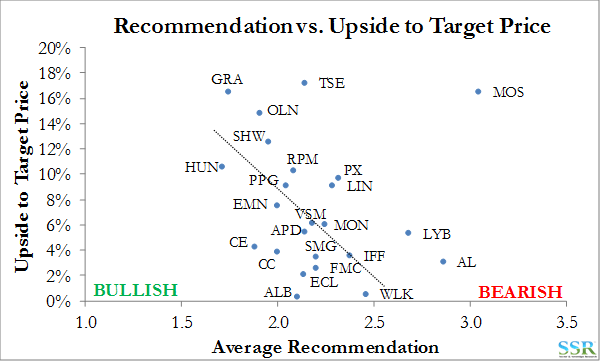 When we look at recommendation versus upside to target price, again APD is not a stand-out, but it is again the wrong side of the line – Exhibit 7. While APD is not the most highly recommended stock in the chemical space – Exhibit 8 – it is among the industrial gas group (although in general the sector is not well liked) – Exhibit 9. 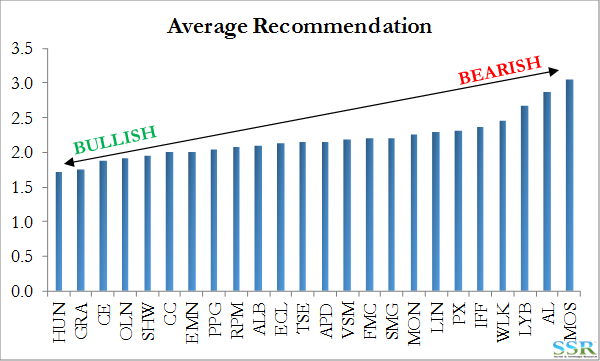 As we have shown in prior work – recommendations tend to be a counter-indicator of forward performance. 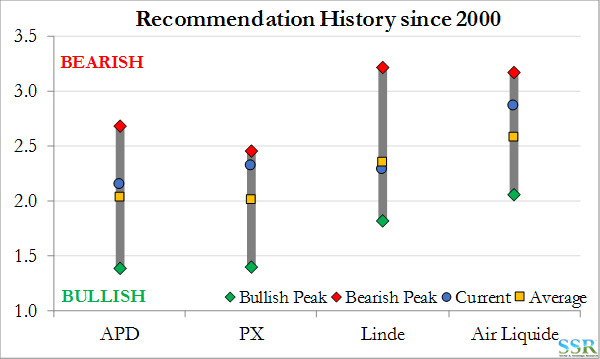 Long PX – Short APD is the obvious trade if you believe that the LIN/PX deal goes through – Exhibit 10.